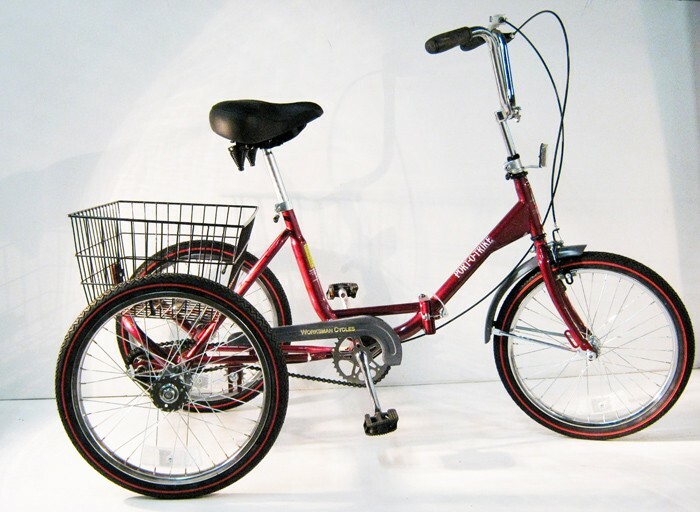 Portotrike Folding Adult Trike with 20""wheels Single Speed (Front CALIPER Brake & Rear Coaster (foot) brake)and rear basket. Compact Adult Trike. Overall Width 29.5"". Folds to a 32 x 30 x 29.5"" cube. Ships mostly assembled via UPS.Maximum Recommended Weight Capacity 225 pounds. Crank: One Piece forged crank 5.5"
Many upgrades and choices are available to customize your Worksman Tricycle. My brothers and I bought a Port-O-Trike for our mom for Christmas. It is a very solid, high quality design. We love that it is still made in the USA. The company made sure to deliver the trike well in time for Christmas, which I appreciated. We were able to assemble it in about an hour. I wish the written instructions were a bit better, but we found a 'how to' video online which helped a lot. The people we spoke with at the factory were very nice and most helpful. We special-ordered the LED pedals, and the first pair did not fit. But when I spoke with them, they immediately apologized for the error and sent the correct size pedals immediately at no charge. 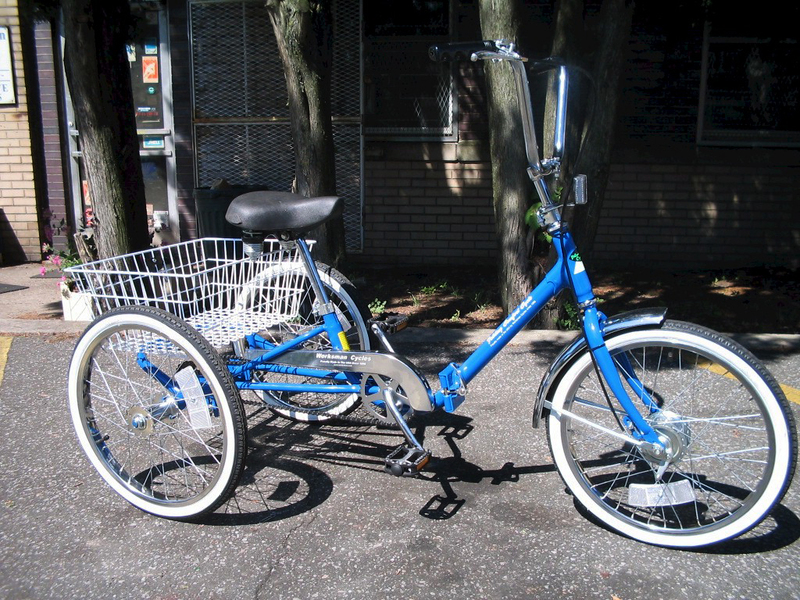 I am the proud owner of a Port O Trike PTCB. It's my favorite color which is green. I discovered Worksman and decided to purchase one of the bikes. It is the greatest - I ride it just about every day. I live in Florida so we have nice weather most of the time. The people at Worksman are super - nice, helpful, and always there to answer your questions. It was no trouble at all to put the bike together - very simple - I'm a 70 yr old woman and the chore was easy for me. My trike arrived in good time and I was out riding in a couple of hours. I highly recommend Worksman, if you are looking to buy a great bike/trike. To see photos of custom order options please click here. Download the Owner's Manual here.